I wanted to provide a quick update on one of the many road projects involving Metro: improvements proposed for the 710 corridor between Long Beach and the 60 freeway. In 2008, Metro launched an environmental study on how to improve this part of I-710. As many battle-tested motorists already know, that segment of the freeway is often very congested. The main problem is that the freeway is just three lanes wide between Long Beach and the 405 freeway and four lanes wide between the 405 and 60. In addition, the freeway is often clogged with both commuters and truck traffic that is traveling to and from the ports of Los Angeles and Long Beach. Among the alternatives being studied for the project is widening the freeway to 10 lanes (five lanes in each direction); adding four elevated truck-only lanes adjacent to the 710 (two lanes in each direction); restricting the truck-only lanes to be used by trucks with zero tailpipe emissions; and possibly tolling the truck-only lanes. That’s obviously quite a road widening and one of the few still possible in the region, where freeways are often hemmed in by development. 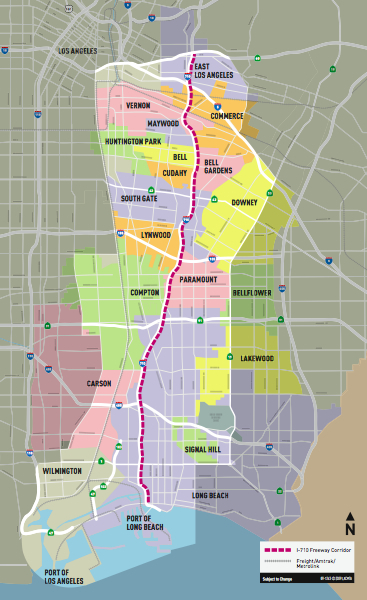 In the case of the 710 south, such a project is possible because of the utility corridor that exists between the 710 and the Los Angeles River. This is not just a project about improving traffic, Metro officials say. Neighborhoods near the ports and the 710 freeway have long pointed to studies that show very bad local air pollution in the corridor from vehicles, trains and ships. The air is so bad that it likely leads to premature deaths in the region. Here’s a link to a U.S. Environmental Protection Agency web page on air pollution from diesel emissions in the freight corridor north of the ports. 1. The hope is that the new configuration will result in overall better traffic flow and fewer idling vehicles. “A car sitting in congestion is more polluting than when it’s moving,” he says. 2. Separating some of the trucks from cars on the freeway should make the 710 safer, with fewer accidents resulting in less traffic tie-ups. 3. Because traffic is often bad on the 710, many motorists and trucks are using parallel streets as a short cut. It’s not good for residents of those neighborhoods and many of those surface streets do not move that kind of traffic efficiently. Officials hope that an improved 710 should help lure that traffic back to the freeway, where it belongs. 4. Last, and certainly not least, Metro is working with state air pollution officials and a group called Calstart to create a cleaner fleet of trucks for use on the road. One possibility being looked into: is it possible to create a truck powered by overhead electric wires on the freeway’s truck lanes? The project is in the planning phase. In September, in response to concerns about the project’s footprint, the Executive Committee agreed with stakeholders to make changes to the project, which would extend the time it will take to complete the draft environmental impact statement that is underway. Now that recommendation is going to the full Metro Board of Directors on Dec. 9. The goal is to release the study next fall. There are still money challenges. The construction cost of some of the alternatives ranges from $3.8 billion to $6.7 billion, depending on which alternative is selected. As part of the Measure R sales tax increase approved by L.A. County voters in 2008, $590 million is available for the I-710 project. In order to help address the funding shortfall, this project and five others, is being studied for a public-private partnership — i.e. deals in which private firms help pay for a project’s upfront cost in exchange for payments later. This is one reason the tolling option for trucks is being studied. This is certainly a big project in Los Angeles — or anywhere else, for that matter. But Metro’s Doug Failing believes it has a good shot of succeeding. Expanded highways = more cars on the freeway = more cars on the streets = more congestion on local streets = wider street roads = more bad air. How is this a win-win situation? How many road widenings do we need to prove that traffic never decreases? You’re just putting on a bigger waste for a “fat man”, who will eventually grow into it and not “reduce the fat”. Enough with the rhetorical games, Metro. This is a freeway EXPANSION. It may or may not be an “improvement”. Doug Failing and Metro still DO NOT get it! Cleaner trucks = good, but just imagine how much cleaner the air would be in Long Beach and the surrounding areas if only local trucks traveled there. If the long distance haulers of cargo containers, 70% of the ones that come in to the ports, met their goods outside the city. Imagine how many fewer truck accidents there would be if shipments were moved via electric rail to a modal center for distribution. There would be NO NEED to expand or extend the 710 at all. Please join us here in the 21st century folks. Concur what LA of Anaheim wrote. Can Metro and elected officials please stop dragging their knuckles on the ground and evolve? Please? Nonsense. The “main problem” with the 710 is that it is free, the second problem is that despite having 4 to 5 lanes, there is no lane devoted to car pools. And the really big problem (from a “too much traffic” standpoint) is that most people driving on it want to get to Downtown or Westside Los Angeles, and those connecting freeways are packed with traffic. I’ve commuted the length of the 710 for about 2 months (2 years ago), and traffic is only a problem at the intersection with 5 (sometimes backing up for miles south) and at the north end of the freeway. The section in Long Beach with 3 lanes is almost always free flowing at 45 to 55 mph. And expansion of this freeway would mainly serve trucks from the Ports. They spent billions to widen the Alameda corridor railways; let’s send stuff by train thru that privately funded, but underutilized system, instead of having trucks drive on the 710 for free. Good point about the trucks. That’s one of the major problems with our freeways and their congestion, the trucks take up much more space and must move slower, decreasing the efficiency of the freeway and slowing everybody down. Freight should be used for all or almost all long haul movement of goods, yet it seems like in the US at least, we use trucks just as much as trains for long distance shipping, taking up unnecessary road space. Fright is for that purpose. Trucks are for movement between the freight hubs and the intended destination. 3.8 billion to 6.7 billion dollars would build a lot of subway, light rail or commuter rail. Use the already committed $590 million Prop. R money to build better freight hubs at the port and inland, and to construct car pool lanes on the 710 between the 105 and the 5, and a car pool interchange between the 710 and the 5. And stop there. Put the freight in the Alameda Corridor!